At the club on Monday 30 Sept I could not remember the names of software I had tried. RawTherapee 4.0.11.1 was the software I had tried I will not pretend it's as good as Photoshop Camera Raw 6.5 however not that far behind and I does seem to work with modern cameras so those with CS4 or lower may still find it better than converting RAW files to DNG first. I also use Picturenaut for HDR and Hugin for Panoramas and FastStone Photo Resizer to reduce photos for web use and club competitions. Gimp does seem to do a good job but since I have Photoshop can't see the point in learning how to use another package. UFraw goes with Gimp but I was rather disappointed although it has curves in real terms one needs to be rather clever to be able to use curves but the sliders with Camera Raw 6.5 and RawTherapee are so easy to use. I can only say how I have now changed to taking all I can in RAW and using Camera Raw 6.5 I find once converted to Jpeg or other format there is very little left to do dodge and burn is replaced by the adjustment brush for example so it would seem much of what I learnt to do with Photoshop is now redundant. I do use cameras without the RAW option so not totally waisted but why learn multi ways to do the same thing if you don't need to? Eric, not sure I totally understand or have this right but I would only ever convert to jpg when I am going for my output image. From raw I either go to tiff or psd. JPGs only ever used to generate final files eg to hand in for comp. I would agree Jpeg or PNG is what I use to display on web or TV and work in progress normally saved in a format which retains any layers used. However I find my skills are improving thanks to the club so for images taken in the past I normally want to start again from scratch so will revert back to the RAW image. Most of what I do is for use on the web so I will go through the following stages I am sure there are errors so any comments welcome. 1 Open up in Camera Raw 6.5. 2 look at light areas and set the Exposure slider so I can set some details in light areas. 3 look at dark areas and use fill light so I can make out details in dark areas. 4 experiment with contrast and select level I consider looks best. 5 return to fill light and re-adjust. 6 look for a white area specially if there is any white water and adjust temperature. 7 check if any alteration in tint is required. 8 play with clarity and see if this needs moving. After this much depends on the photo in question using adjustment brush to lighten or darken areas and where there is a line horizon then graduated filter. Spot removal to remove dust spots and red eye removal if required. I never straighten in RAW find easier in Photoshop but some times I will crop. I then select all images I want and then Save Image and save normally as a Jpeg all settings to max and finally select cancel so no side car is produced. The Jpeg is then opened and straighten in main Photoshop I check the levels normally clicking cancel as already been done and last the unsharp mask. There will be specials where I make multi-saves then combine with layers and masks or combine with other images for focus, panorama or HDR but above is how I handle the bulk of images I have. Hope I can now stand back and the thread will grow! That looks like a decent workflow. Where I would be different I would crop first and then set the white balance. Both of these do affect the tonal balance of the image and can affect the way that you then might want to set the other tonal variables. If one is using LR5.2 the recommendation is to work sequentially down the list of tone controls in the basic panel after setting global white balance. However it is frequently an iterative process even adding output sharpening might make one want to change contrast a bit! If I need to do pixel editing I export to Photoshop either as the RAW file with LR adjustments or as a 16 bit TIFF. I only create jpg's for export to email, web or other external users, from the finished work. Thank you David yes good idea to crop first however the original idea of the post was to point out there is free software that allows one to work in RAW. The beginners group were talking about working in RAW and I commented that UFraw will change a RAW file to Jpeg but unless you do all the alterations while still in a 16 bit fill be it RAW or TIFF then really no point in taking in RAW. I no longer have Gimp on my PC so only going from memory but seem to remember it only worked with 8 bit files. Yes it can handle TIFF but only 8 bit that's why people use UFraw to get RAW files into 8 bit. It is now RT 4.0.11.48 for Windows XP 32-bit or newer 32-bit See this link it seems far better than UFraw but not as good as Photoshop Camera Raw 6.5 so for those who don't have photoshop it is well worth installing. Although folk have taken agin Adobe of late they are still the big player and likely to give long term support to their software. I have decided to stick with Adobe. Lightroom has come down in price and is excellent in several of its features (the slide show module is very limited). If you need pixel editing then Adobe Photoshop Elements is a strong product and has a cut down version of Camera RAW. With both you get a permanent license and regular updates to support newer cameras. I know, what if Adobe go the subscription model as they have with their professional suite? Who knows, but then who knows if ones free software will still have support next year? Will they support new operating systems when you have to update your computer? having just written that Adobe have had a major security breach. B..... my account is amongst those affected what a pain. The reason I went to CS5 is CS4 did not support my camera even with the updates. That is a problem with paid for software you have to continue to pay. My dad bought Elements 6 he was told it was Photoshop and expected to do the same as I did with my version still sold new at £27 only came out in 2007 (2008 on Mac) there has since been a version released every year. There is of course Adobe Photoshop Express but uses flash and Apple does not like flash so Microsoft and Linux users can use it but not Iphone, Ipad or any other Apple device. This is why I re-wrote my web pages without use of flash. I would not expect you to use RawTherapee David there would be no point and neither will I use it but that does not mean those who don't have expensive up to date software will not benefit from it. And since it follows the same general principles as Photoshop if they do lash out then what they have learnt will still help them. Quick correction it is Apple devices that use iOS that cannot use flash. No problem with macs. Thanks for that I clearly don't use a Mac any more. I was asked about batch processing RAW files on Monday 6th Jan and on return I had a look. It would seem you can batch process files. Using Ctrl and right click one can select a number of similar files as shown above. The panel on the right can then be adjusted to the effect required. Once the desired adjustments have been made then Ctrl Q will put them in the queue. When you have done enough and are ready for a break click the Queue tab at the top then as standard it will say in Output Directory Use template %p1/converted/%f if this is selected it will save the converted files in a sub directory called converted where the files were found. To right you select file format and if JPEG the quality. Clicking “Start Processing” slowly the images will disappear from the list as converted. It is slow so not really something you want to watch. Time to walk away and leave. About 60 second a picture. To me the whole idea of RAW is to process as much as you can while still in 12 bit or what every bit level your RAW file is before converting to 8 bit. With CS5 and RAW 6.5 one has some very powerful tools Spot Removal, Red Eye, Graduated filter, and adjustment brush to name some and this allows one to selectively lighten or darken areas of the picture. I am not saying they are not in RawTherapee but I can't find them. There are also some tools like tone mapping which are in RawTherapee but not in RAW 6.5 so it does work both ways. However it means one needs a different approach and making multi-images over correct and under exposed and using layers and masks to blend may be one option. But without a working knowledge of programs like Gimp I have no idea of how easy or hard it is to blend images and to continue in Photoshop is rather pointless as if one had Photoshop then unlikely one would want to use RawTherapee. Since RawTherapee does work with RAW files which Camera RAW below 6.5 could not handle like Nikon RAW I suppose some may still want to use it even when they have Photoshop but be it Gimp, Paint Shop Pro, or any other non Adobe program then the problem is not what it can or can't do but getting some one else who uses it to give guidance. I did an internet search for RawTherapee instructions and I found most were for early versions not RawTherapee 4.0.11.1 I have installed. I have one big complaint about RawTherapee in that every round and again when I come to save it crashes. OK not very often but to have added 100 pictures to the "Queue" then to click on Start Processing only for it to crash is not my idea of fun. It is better than UFraw and many of the bundled software options for converting. Both the Pentax software and Nikon software required skills on how to use curves to convert RAW to Jpeg and are next to useless. But until RAW 6.5 fails I am not intending to change in a hurry. Maybe what we need is a free software users section so people using RawTherapee, Hugin, Picturenaut, Gimp, UFraw, FastStone, Photo Resizer, DNG Codec by Ardfry Imaging, PhotoStage Slideshow Producer, Audacity or any of the other free software packages can swap ideas without getting bogged down with the expensive alternatives like elements, CS6, Lightroom and Photomatix. As to the cut down or advert laden or limited time versions for free when one has to pay for the full version later or have banners scrolling like with PicturestoEXE I am not sure. I use the free version of PicturestoEXE for my own use but would not enter an AV into a competition using the free version with scrolling banner. So lets see what the teams thinks? Should we have a section for free software users to talk about how to use the software? As a result of being in the club, I have been completely converted to the benefits of RAW and am amazed at how much additional information can be pulled from highlights and shadows and of course, the freedom to adjust White Balance as the first step. I'm a late adapter of PSE 11, which I note has already been replaced by PSE 12. Abobe deliberately imposes an upgrade limit for the Abode Camera Raw element of each version of PSE and previous versions of PS. Future camera bodies will therefore not be covered by PSE11 without upgrading or going via the (less convenient) PNG route. I personally will not rent software. So I continue to keep a close eye on free software and was previously using Gimp, Hugin and Luminance HDR for JPEGs. Gimp in particular is hard work but for a free package offers a lot of scope. I still use it for some procedures. 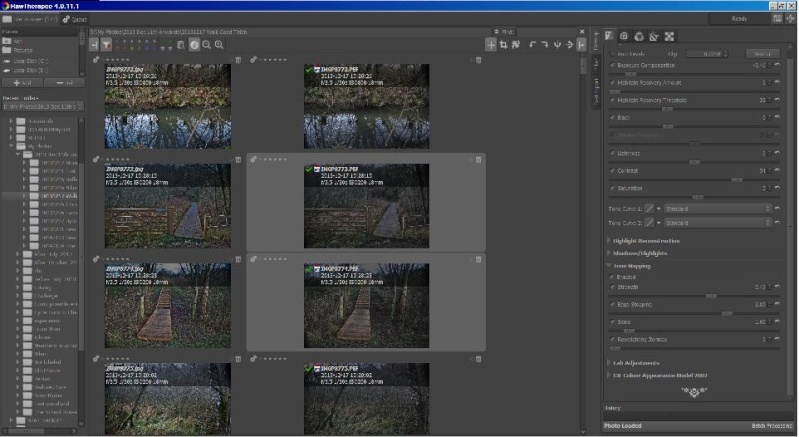 I also looked for an alternative to Pictures2Exe, which appears to be excellent but not cheap software (£75?) for my likely limited use. There doesn't appear to be a viable free alternative other than Windows Movie Maker coupled with Audacity, Movie Maker limits presentation options and quality for stills if reviews are to be believed. I also felt that I could not enter the Club AV competition for the want of alternative software. So in reply to Eric, I think the Club should have maybe a Forum 'sticky' or section on the various software options, including the advantages and disadvantages for each package. 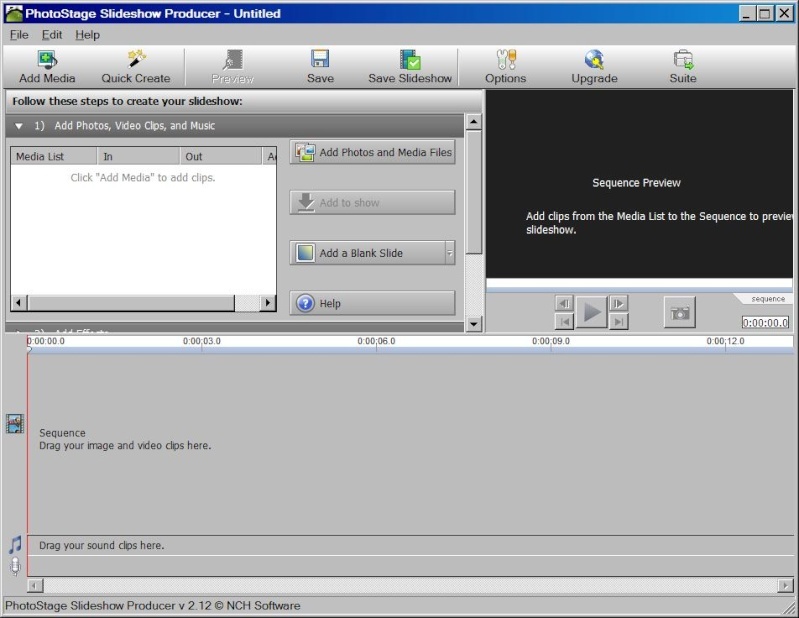 PhotoStage Slideshow Producer was the free alternative to Pictures2Exe. This was demonstrated in the club while we were in the Daniel Owen Centre I would not sing it's praises but it is free. From what I remember as long time ago when I down loaded it came with a lot of useless or paid for programs which I deleted leaving just PhotoStage Slideshow Producer. Thanks Eric, I will check it out. It seems to me that the free software does the job OK and sometimes extremely well, but the penalty may be a rather clunky workflow or as Eric reports with Rawtherapy occasional instability - I have seen this reported elsewhere as well.